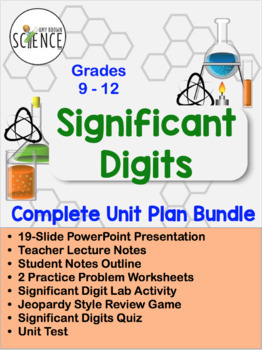 This unit has everything that a teacher needs to teach a unit on significant digits or significant figures to physical science, chemistry, or physics students. This bundle contains a teaching PowerPoint, lecture notes for the teacher, an outline of the notes for students, a lab activity, practice problem worksheets, jeopardy review game, a quiz, and a final unit test. This bundle includes the following products. Clicking on each link will allow you to view a detailed product description of each item included in the bundle. Pictures of rulers with different markings are used as examples to help students understand the meaning and importance of using significant digits in scientific measurements. All of the rules for using significant digits are clearly stated. Many examples using each rule are given. Once the rules have been covered, students are given practice problems that involve the use of all rules. 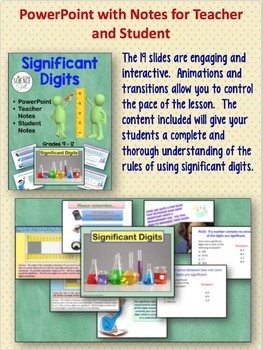 Determining significant digits when rounding. 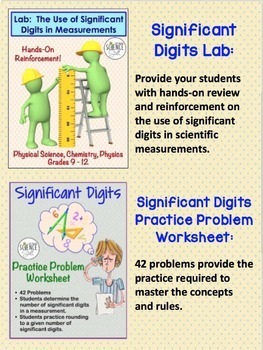 Students are given practice problems and asked to round to a given number of significant digits. 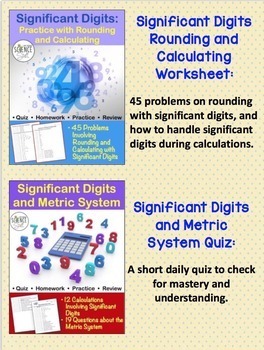 Rule for rounding to the correct number of significant digits when adding and subtracting. Rule is clearly stated. Students are given practice problems. Rule for rounding to the correct number of significant digits when multiplying and dividing. Rule is clearly stated. Students are given practice problems.